Here are some great beach front hotels in San Diego North County. From Oceanside to Del Mar, we can help you choose the best San Diego Hotel for your San Diego family vacation. The Southern California Beach Club Oceanside is a San Diego beach front hotel right off the Strand at Oceanside beach, with easy beach access. It features a rooftop jacuzzi spa on the top floor and ocean views from many of the private balconies. This is right on the Oceanside California beach near the Oceanside Pier. Swimming, surfing, boogie boarding and walking are popular. There are many San Diego beach firepits available, and nearby playgrounds and parks. 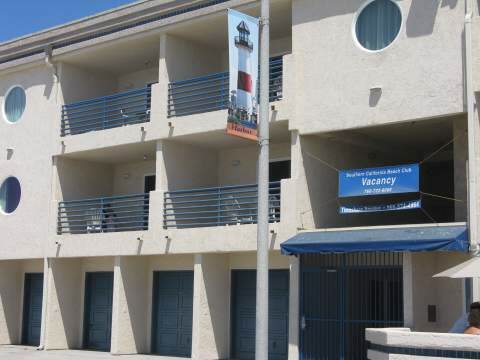 If you are looking for Oceanside CA vacation rentals at a moderate price, this is a great place right on the beach. On the beach in beautiful Carlsbad, the Tamarack Beach Resort is one of the beach front hotels in San Diego county, in the city of Carlsbad. Close to all the Carlsbad attractions including Legoland California, Sea Life Aquarium, Carlsbad Flower Fields, Carlsbad Premium Outlet mall. The nearby Carlsbad Tamarack Beach is popular for swimming, sunbathing and volleyball, and has a new biking and walking path. Nearby Carlsbad Village has many nice restaurants and shops. You are at a prime location to head south to San Diego attractions or north to Disneyland. This is one of the nicest Carlsbad California beach hotels. The Hilton Garden Inn is a lovely north San Diego beach front hotel, located in Carlsbad California. The hotel and grounds are nice, and you can watch the sunset over the Pacific Ocean or walk across the street to the beach. Nice garden restaurant at the hotel. You are centrally located and have an easy drive to many very fine beaches in the area, such as Tamarack Beach to the north or Moonlight Beach to the south. You are just a short drive to many Carlsbad attractions in the area, including Legoland and the Sea Life aquarium, and the Carlsbad Flower Fields. While this is a good Carlsbad California beach hotel if you just want a view of the ocean, you would be advised to choose a different beach front hotel if you want to enjoy the beach in front of you. Downtown Encinitas on the historic 101 is a charming beach town, with a 1960s flavor. 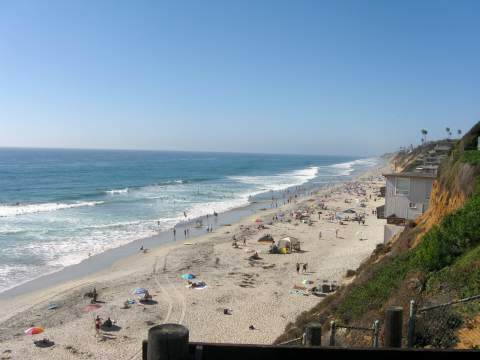 If you want a historic beach town experience, and spend some time at a nice swimming beach like Moonlight Beach Encinitas or Swami’s surfing spot, then consider a stay at one of the nearby downtown Encinitas hotels along the historic 101. There are good surfing and swimming beaches all around, and you can walk all over the downtown Encinitas and the beach, or bike ride along historic 101. Walk to Swami’s surfing spot, explore the local tidepools, visit the beautiful meditation grounds at the Self Realization Fellowship Temple, and dine at some fine local restaurants. A great taste of old Encinitas. A good jumping off spot to explore further north or south in San Diego without breaking the budget. The historic town of Encinitas and historic 101 is part of the whole experience in Encinitas, so don't worry if your hotel is not right on the beach. Moonlight Beach Hotel is the closest to Moonlight Beach, just a short distance to this lovely beach. 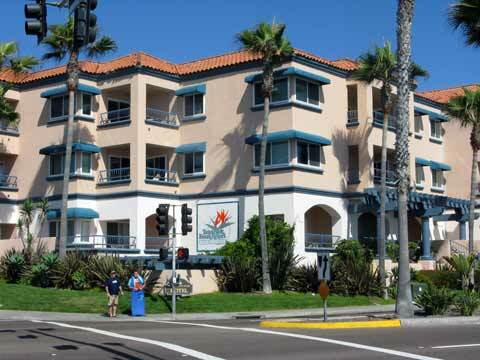 Quality Inn Encinitas is located on the historic 101, just two blocks from Moonlight beach. The Encinitas Econolodge, a non-smoking hotel, is on the historic 101 four blocks from Moonlight beach. The Inn at Moonlight Beach is a lovely Bed and Breakfast in Encinitas, is just off the historic 101 and a 5 minute walk from Moonlight Beach. The Del Mar Motel on the Beach is next to the Poseidon restaurant right on the Del Mar beach in San Diego. This small San Diego beach front hotel has a great location, in the upscale community of Del Mar and is right on the beach. The location is perfect and there is a lot to do – beach volleyball, surfing, sunning and shopping in Del Mar. 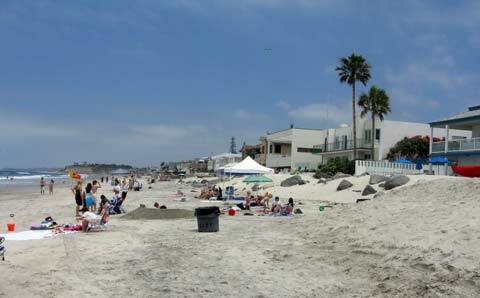 If you are looking for beach rentals right on the sandy beach – Del Mar Motel on the Beach is a nice find. Other on the Beach Rentals in Del Mar are nearby. This is one of my favorite beaches!